The Metropolitan Cooking and Entertaining Show was fun, but crowded! The bf and I got to see Giada de Laurentiis (Food Network) cook live, but we were so far away! Luckily there was a large TV screen in order to see her. This is what the floor looked like early in the morning. It wasn't as crowded as the afternoon. It was filled with over 200 food vendors! We went crazy with the free samples. I'm going to show you guys some of the vendor's that I found to be memorable. They had really cool savory jellies in herbal flavors that tasted really good on crackers. I thought it was cool since I usually think of jellies as being sweet. The owner James L. Millhouse Jr. was very memorable. 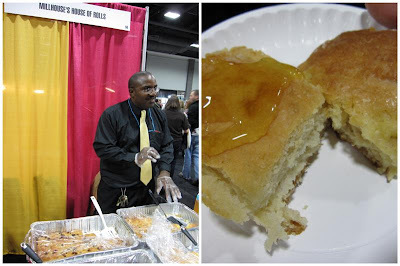 He was one of the nicest people out of the whole place, didn't have a fancy booth or anything, but he was super passionate about his Angel Biscuits which came in 4 different flavors. Very good! Chef and owner Cheryl Schneider named her company after her beloved long-haired Dachshund Penny. 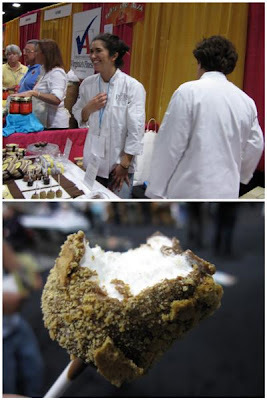 I tried the chocolate covered marshmallow, and it was to die for. They also offer boxed chocolates, chocolate covered marshmallows/Oreos/Graham crackers, chocolate bars, gelato cakes, brownies, cookies and biscottis. Their new location in Fairfax opened this month. Out of all of the dip mixes at the show, Linda's Garden was the best. The flavors were so bold, and the variety was huge! Here are the flavors they offer: Basil-Garlic, Cajun, Dill, Garlic, Habanero, Horseradish, Italian, Jalapeno, Tarragon, Veggie, Spicy Veggie, Tomato-Basil, Lemon-Basil, Chipotle, Onion. The bf an I wanted to buy something for ourselves and chose this AMAZING bottle of Garlic & Basil olive oil. They offer many different flavors of olive oil, dippers, pestos and bruschettas. I've been eating it everyday (I've already used it before this picture) by just dipping bread in it. The flavor is so pure that it makes a great dipping oil. I'd say it's too good to use for cooking since the bottle isn't that big. I wanted to hold contest to celebrate my 1st year of blogging on Lunching in the DMV. -Leave a comment answering this request: "My birthday is in less than 2 months, suggest a cool/cute/unique restaurant in the DMV to celebrate my birthday with some friends"
A 5-piece box of Spice Rack Chocolates in Tangy Grapefruit & Lavender. 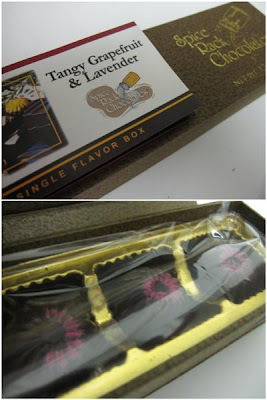 It was the 1st flavor I tried, and we literally came back 3 times to that table because all of the chocolates was so good. You can smell the grapefruit when you open the box. The grapefruit hits you with the its citrus flavor 1st, then the 2nd note is the dark chocolate, then finishes with a calming lavender flavor. Dave should do the B-day package for you :), my girlfriend loved it. I recommend making a reservation ahead of time, they get booked fast. Really good steak( and chicken), they also have seafood.Really good services! oo gourmet chocolate - the way to my heart! suggestions are - oya, zaytinya or rasika. all three are well known for the quality of food, and the first two are great places for bdays and such. Chefs perform tricks for you while they cook your food. wow, is it already a year? congrats and keep it up!